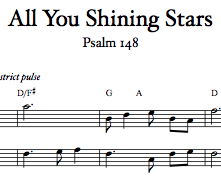 A traditional ballad melody from all over the British Isles, this remains one of the most popular traditional melodies in the world, used for many familiar song and Christian hymn texts. 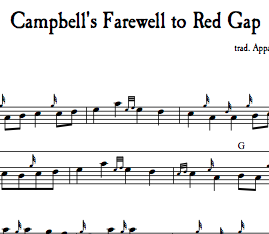 (Tune name: KINGSFOLD; Child Ballad #56) Please see further below for more information and an audio sample. 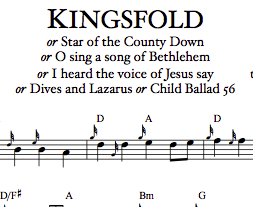 A traditional ballad melody known all over the British Isles, this remains one of the most popular traditional melodies in the Western world, used for many familiar song and Christian hymn texts, including ‘Star of the County Down’, ‘Dives and Lazarus’, ‘O sing a song of Bethlehem’, and ‘I heard the voice of Jesus say’, among others. 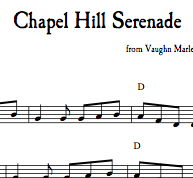 (Tune name: KINGSFOLD; Child Ballad #56) This pipe setting is in B-minor, and includes a three-part harmony based on the Ralph Vaughan Williams arrangement found in many church hymnals. 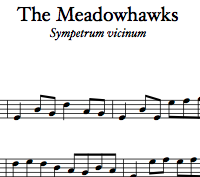 Includes chord symbols (but not lyrics).